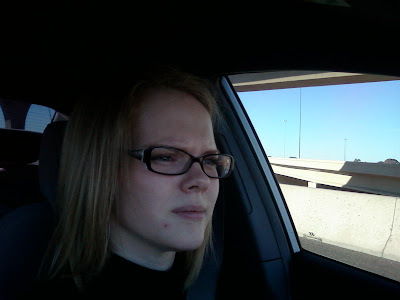 Mom, the Intern: Merging onto freeways. Of course, I was later "baptized by fire" when I had to commute 60 miles a day in rush hour traffic to and from my internship. Now, nothing scares me! Well, except for L.A. traffic. Understandable. Nowadays, I actually find the freeways to be safer and less scary than surface streets. As long as you keep up with the flow of traffic and mind your blind spots, you're OK. Plus, our freeways here are really straight and wide. Easy as pie. The only time I feel nervous about using the freeway is when -- well, let me tell you a story. So, I had a filling done on a tooth last week. It was small, but it was next to a crown and I don't know what exactly happened but the filling was giving me a lot of pain over the past few days. So yesterday, I went back in to have it fixed. It was more involved than I thought it would be and it required three shots of Novocaine. Horrible. It's just not fun to walk around with your face half-numb like you've suffered a stroke, right? Afterward, I wasn't in the best of moods. I just wanted to lay down and maybe have some dinner. I took the 202 freeway home as I usually do. It's pretty much never busy and I live very close to it, which makes for a speedy trip home. Plus it's curvy and kind of fun to drive on. I sometimes (safely) pretend to be Danica Patrick. Well, I turned right to merge onto the 202 when suddenly, I had to apply the brakes. Actually, slam on them. Why? Because the driver in front of me decided it would be cute/safe/hilarious/I-have-no-idea to drive 30 miles an hour down the on-ramp. 30. Now, if you live in Arizona, you know this is ludicrous -- the speed limit is usually 65 on freeways and most people go about 70-75. So of course, I started to panic a little because I was about to hit the freeway going 30, maybe 35 miles per hour, and I'd have to merge over quickly, but everyone else would be blazing past me at twice that speed. Or more. Folks ... the on-ramp has a purpose. It allows you to accelerate so by the time you have reached the freeway, you are traveling at roughly the same rate as the drivers who are already on it. This is a GOOD THING! If you go too slow, you can cause ACCIDENTS! You could be pulverized by that Ford F-150 that's hauling along at 90 and not paying attention! You could get rear-ended when the person behind you is frantically searching her mirror for a gap and rams into you! And most likely, YOU WILL REALLY ANNOY PEOPLE. ESPECIALLY PEOPLE WITH HALF-NUMB FACES WHOSE ANESTHESIA IS WEARING OFF. 1) Fear. It can be terrifying to travel 65 miles an hour down a multi-laned road with no stoplights. You're preaching to the choir. But trust me -- merging too slowly is scarier than merging at the proper speed. Do you want to be smashed into oblivion? Didn't think so. Something tells me if you're scared of driving, you're probably scared of hospitals, too. And coffins. So giddy-up! 2) Over the age of 80. I know you come from an age of horses and buggies, but you've got to get with the times here. Or, just pretend your "buggy" has rocket boosters on the back. Fun!!! 3) Not paying attention. Were you just talking on your cell phone or -- heaven forbid -- TEXTING while driving? Maybe playing Angry Birds??? Then you probably didn't realize that right-hand turn you made was down a freeway on-ramp, not a residential street. You obviously didn't sign Oprah's pledge, did you? For your sake and all of ours, please don't use your phone while driving. Mmkay? Now, watch this very educational (but kind of boring) video for further assurance. YOU CAN DO IT! Have you entered my $50 Target gift card giveaway? Hurry -- I'm picking the winner TONIGHT! i very much dislike with a passion when people don't use the on ramp the way it's intended!! the only reason to go slow is if the flashy light is on and is metered. it's madness i tell you, MADNESS!! You should try merging onto traffic on the autobahn, nothing will scare you after that! Haha The average speed is usually about 100 mph. Took some getting used to, that's for sure. But now I love it and the traffic in the states seems so slow! Jenna, you read my mind!!! Why, oh why, can people not understand that the point of an entrance ramp is so that you are already going the speed of the highway by the time you get to the end of it? I swear that almost every day on my commute someone almost gets hit because they try to merge going 30. Oh goodness! Oh, I hate that!! I always assume it's because of the posted speed limits on some on ramps. But seriously, I just want to pull people over and explain the logic to them. "The purpose of the long, long on ramp is for you to accelerate to their speed..." I secretly dream of having a car with a large LED screen on the back that can scroll through my messages for other drivers. "I am already going 10 mph over on a 35 mph road. I am not going to go any faster. If you don't stop tailgating me, I'm going to slam on my breaks."